Podcaster Nolan Williams takes to the streets to gain students perspective on freedom of speech on campus. Next, he sits down with English Professor Lee Bebout to talk about freedom of expression on campus. Bebout discusses controversial speakers and the politically tense classroom environments. Nolan Williams: For students who are politically engaged, freedom of expression is a fiercely contested topic. Arizona State students don't all agree on how free expression is on campus. Have you heard people argue about the freedom of speech on campus issue? Interviewee 1 (Tyler): To some extent. I think here at ASU, I haven't heard much for our campus, but I've definitely heard issues elsewhere where people have said their free speech has been stifled. Nolan Williams: Have you heard other people say that they feel like their free speech is infringed upon? Interviewee 2 (Andrew): Yes I have. Nolan Williams: How do you feel about those people? Interviewee 2 (Andrew): I can't really find good evidence anywhere on campus where free speech is being infringed upon. Interviewee 3 (Michaela): I just know that being on a college campus, there is a lot of diverse opinions, and there's a lot of people who feel strongly about their opinions. I get kind of nervous that sometimes if I say something it's going to cause a retaliation by someone else or they're going to be saying mean things or doing mean things just because my opinions don't agree with theirs. Interviewee 4 (Marcus): I think free speech is an important issue no matter where you are in America. It's one of our founding principles, and it is something that should be upheld. That being said, there's also a difference between free speech and violent speech or hate speech. Interviewee 2 (Andrew): (Interjecting) I disagree. There's not a difference between free speech and hate speech. Nolan Williams: Before we get into that, do you think there is anything that would keep somebody from talking, other than direct reprimands? Interviewee 4 (Marcus): I think that's something that can be seen especially in today's polarized era. It's very easy for people to be concerned about an outbreak, a fight, or offending someone. As a retaliation for that, they'll either just not talk at all, or they will keep their voices in a small echo chamber where they get the same opinions over and over again. That's is why it's important for people to be able to discuss politics anywhere they go. Nolan Williams: These interviews broadly reflect the positions held by students in this debate. A perspective not usually examined, however, is that of the professor. I sat down with English professor Lee Bebout to hear an educator's perspective on the issue. Lee Bebout: My name is Lee Bebout. I'm an associate professor here in the English department at ASU. I teach in the Tempe campus and I do work in Chicano literature, Chicano studies, critical race theory, things along those lines. Nolan Williams: Tell me a little bit about your perspective on the discussions about free speech on college campuses. Lee Bebout: It's kind of an interesting thing. There's the conversation about free speech as it happens in the classroom, and then there’s the conversation about free speech where a student group or the university invites a speaker who causes controversy. I think those are really, in some ways, two different things. In the classroom professors have academic freedom, which may or may not dovetail with free speech issues. It's more about a professional obligation to inquire into the truth and to do due diligence and to teach specific methodologies and specific issues in a field. Then there's the more publicized debates circulating around groups that bring in controversial figures that spark debate. Charles Murray was brought out to a university a couple of years ago. It sparked a bunch of controversy at that school, and, I think in some ways, rightly so. The universities have to really strike a balance. They have to be able to bring in different ideas, but, at the same time, this guy has supported white nationalism and racist approaches to policies concerning African-Americans and Latinos. Universities have to protect free speech to some degree, but then also recognize that they have to protect their students. That puts universities in a real bind. Nolan Williams: I have a friend who is a conservative English major, and, in most of her classes, she felt stifled. She felt like she couldn't fully say what it is that she believed because there would be an avalanche of angry responses in the classroom, or she might potentially get a worse grade on a paper. There are a lot of people that feel that way and believe that. How do you respond? Lee Bebout: I think that it's really critical that faculty elicit other responses in the classroom, and that's why I think providing a language and recognizing that the classroom needs to be a space of shared vulnerability where people with different perspectives can articulate themselves. The whole fear of the bad grade is highly exaggerated. I'm not saying that people don't feel that way. I'm just saying that, that's not how people actually grade. I'm sure that there might be certain instances of that. I know what my political beliefs are, and I know that I'm teaching a class right now and I've got students who are writing things that I completely disagree with, and they're getting better grades than the people that I agree with. Why? Because they have stronger sentences. They use evidence. They organize their ideas. They conjugate their verbs. These are the things that I care about. I care about clarity and voice and organization. Do I care about somebodies’ political beliefs? Absolutely. I care more that they've thought about their political beliefs. Do I grade them on their political beliefs? No. If I was talking about Charles Murray or Milo [Yiannopoulos] or somebody else, those situations would be a little different. Those are people who are invited in, and it's actually not a conversation per se. I think it is important for us to listen deeply to even the people that we disagree with, at least in the context of the classroom. Nolan Williams: What do the students lose when their professors are self-censoring? Lee Bebout: They lose perspective. They lose an opportunity to learn from somebody who is able to do their best. Nolan Williams: For the State Press, I’m Nolan Williams. 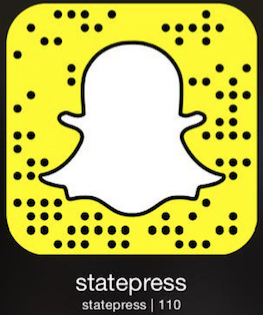 Follow the State Press on Facebook and Twitter.